Coming soon from Jerry Macaluso and the rest of the team at Pop Culture Shock (PCS) is The Sorceress. Jerry just revealed in the PCS newsletter, the pose that PCS has chosen and it’s awesome. The base is made up of some curious looking skull ornaments. These are pictured inside Greyskull in the Filmation cartoon though they aren’t iconic by any stretch. Given that it’d be impractical to make the Greyskul l throne the base (just far too large) it seems that PCS did their homework and selected these guys instead. This looks like a wonderful sculpt. As usual the PCS statues are done in Premium Format at 1:4 scale. 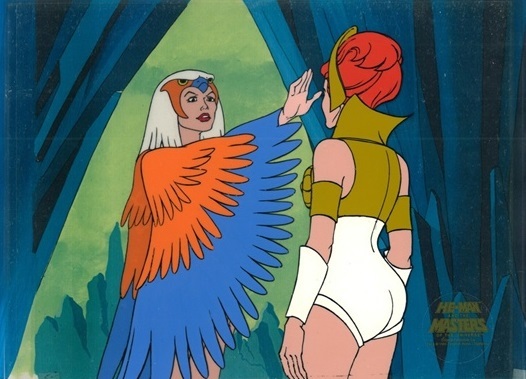 The latest episode commentary from the official He-Man channel by James “Bustatoons” Eatock is on the highly rated “Teela’s Quest” which explores the relationship between Teela and her mother the Sorceress. As usual, we get treated to a lot of great behind the scenes information. Rewatch this great episode with Eatock as your cartoon tour guide.